This tour combines some of the most popular attractions in Iceland. After exploring the wonders of the whales and seabirds it is ideal to enjoy the stunning sites of the Golden Circle. Time: *09:00 - 19:00Available: 1 February - 30 NovemberDuration: 9-10 hrs. Time: **14:00 - 22:00Available: 1 June - 31 AugustDuration: 9-10 hrs. You will be picked up at your hotel or nearest bust stop by Elding's shuttle bus approx. 45-15 min. prior to the whale watching tour sets off at *9:00/**14:00. 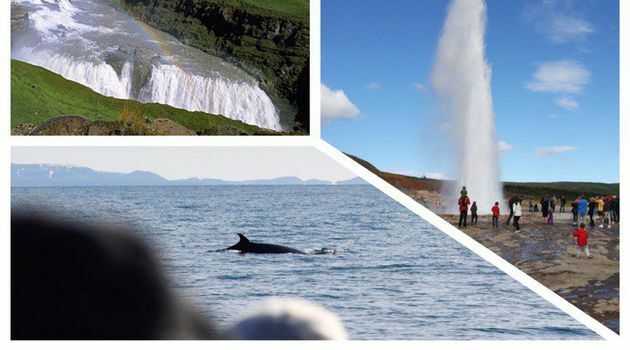 See the whale and dolphins that reside in Icelandic waters year-round and enjoy views of Faxaflói bay's surrounding areas; Snæfellsjökull glacier / volcano, mount Esja, the Reykjavík skyline and much more. 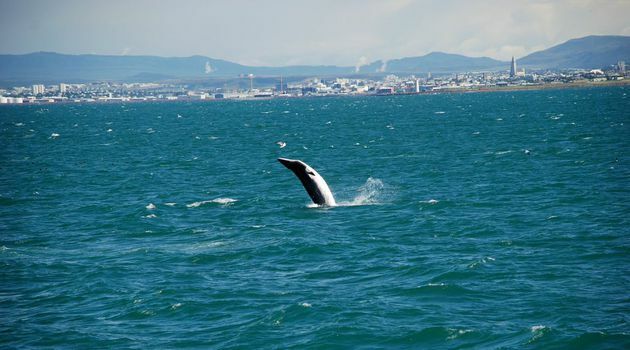 The four most common whales we see in the area are the Minke whales, Humpback whales, Harbour porpoises and White-beaked dolphins - although other species such as Killer whales (Orcas), Fin- and Sei whales among others have also been seen in the recent years. Many seabirds frequent the tours as well and in summer we even often spot Puffins (May-August) flying about and searching for food to give to their young! 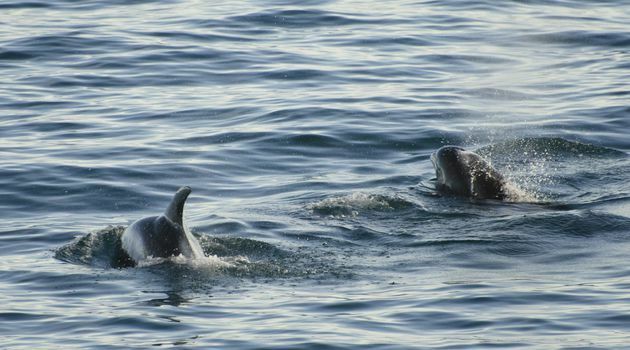 After exploring the wildlife of the bay you will return to the harbour approximately 3 hrs. later, just in time for your next tour. At *12:30/**17:30 you will be picked up by Gray Line's shuttle bus in front of our Elding's ticket office for the Golden Circle Afternoon tour. You will be visiting some of the very best known historical sites and natural phenomena in the country; Þingvellir National Park, Gullfoss waterfall, and Geysir geothermal area. Þingvellir National Park is a UNESCO World Heritage Site and one of Iceland's most significant places in terms of nature and history and is the place where the first Parliament 'Alþingi' was founded in 930 AD. It is home to Iceland's biggest natural lake, Þingvallavatn, where the American and Eurasian tectonic plates are drifting apart creating a unique landscape. Gullfoss is a double cascade waterfall that thunders down the narrow Hvítárgljúfur canyon and Geysir geothermal area is where you can witness the hot spring Strokkur erupt with scalding water every 5 minutes or so. Don't miss out on this full day of adventures and check availability on the calendar! 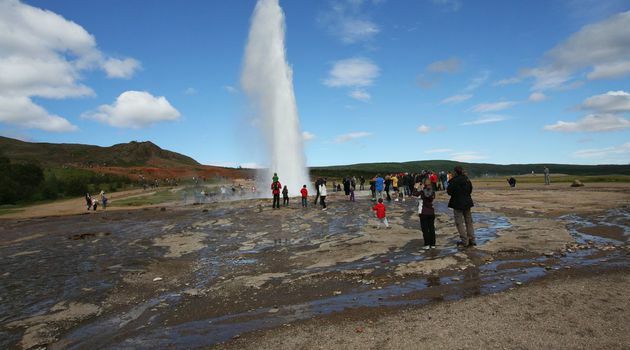 This tour combines some of the most popular attractions in Iceland. 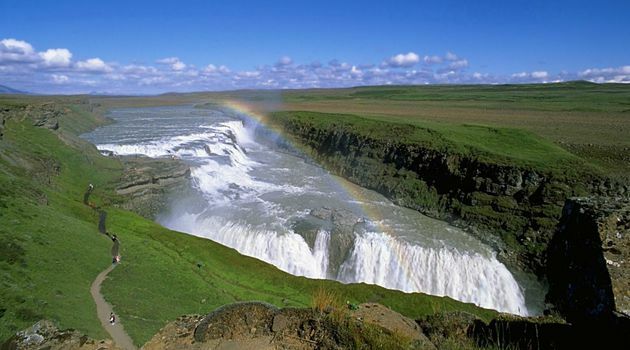 After exploring the wonders of the whales and seabirds it is ideal to enjoy the stunning sites on the Golden Circle.